This is a rare picture taken by a German magazine that managed to get access to Evin prison in Iran during the 1980s. 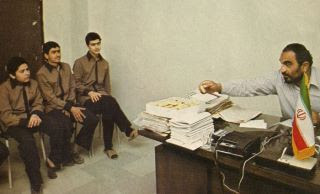 On the right, sitting behind his desk, is the psychopath butcher of Evin prison, the evil henchman Lajavardi, offering a biscuit to the teenage political prisoners, to demonstrate the Islamic kindness in front of the foreign reporters. Look at the teenage kid sitting on the left. Look how young and innocent he looks. Most probably, all this kid was ever "guilty" of was selling some Left wing newspaper on a street corner or handing out leaflets. God knows what happened to these kids and the mind shudders to think what they had to endure. It is for the sake of those innocent kids that I loathe and despise Islamic Republic apologists in the West. The snotty nose tyranophile la-dee-das who turn away and ignore the real tyranny and terror. But what of the real horrors that go on these days? Especially with the gruesome terror tactics and interrogations now being further shared between the thug Iranian and Syrian Regimes. And yet fear is the only seed that both these Regimes now have left. Did fear largely suppress the recent Iranian silent protest Potkin? Any thoughts or a culmination of theories as to why this didn't really seem to take off? And is it true that Khamnei is now using fear to get people to vote. In so much that if you don't vote, it blackens your name in any future employment prospects or not being granted certain licences? If so people SHOULDN'T vote out of princible I think! Submitting to blackmail only buys the Regime more time on it's dwindling life support! Only by denying it's voice and oxygen will the people finally gain the breath of fresh air into proper fair jobs and the licences to acheive anything they want within any proper rule of law society. Good sir, where did you find this picture? Truly bizarre, akin to a photo of Beria (Stalin's longest lasting hangman) playing with Stalin's daughter on his knee. Even levity takes a certain menace when the person horsing around, or offering people biscuits, has so much blood on those same hands.